In order to provide the best race experience possible, and take away any fears of registering early, we've updated our registration platform, and added race cancellation insurance! This means in the case of a race needing to be canceled do to natural disasters, or something similar that is out of our control, you will receive a full refund without having to do anything! You also have the option to add your own personal no-show insurance upon registering. See the details and T&C’s here and sign up when you checkout. Youth Triathlon - 6-15 years old. Adult Triathlon - 16 & over years old. Please Note: Ages above are representative of the athletes age on the last day of that year (USAT AGE). This means a number of athletes will be racing at one year older than they are during the race if they have not yet had their birthday come event day. 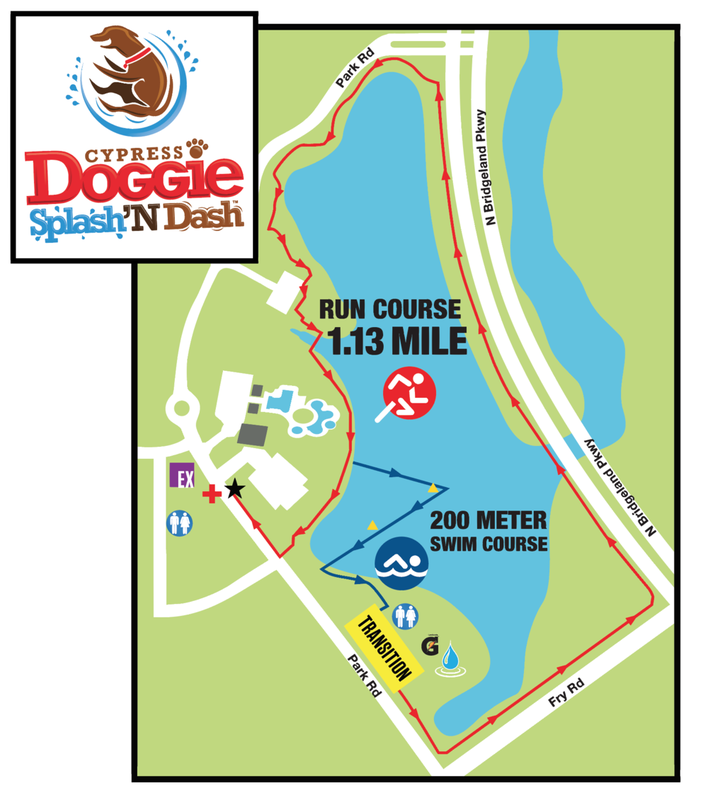 There is no event day registration for any Cypress Triathlon events. We have a very strict no refunds, transfers, or deferrals policy. Much of what goes into producing an event like this is spent up front and offering refunds, transfers, or deferrals may effect the future of the event because funding is allocated early. Please do not signup unless you are sure you'll race and/or you're willing to accept the registration loss if you end up not racing, for whatever reason. Thank you. It is your job to frequent the website and check your emails. If you use a work email there is a good chance our emails and website will be blocked by your firewall. Use a personal email address and check the site from home. Like us on Facebook and join our newsletter to get the latest information. Any changes made to the race are done because we have to, usually out of safety for our participants that arise after the race has been planned. 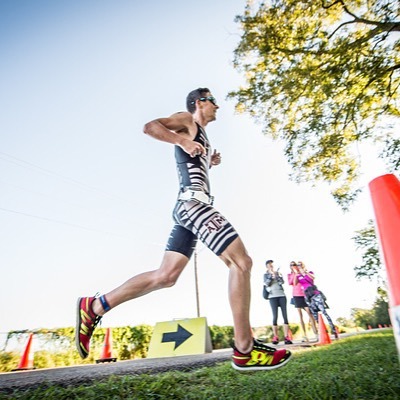 We are triathletes too and do everything to create a better, safer, more enjoyable experience for all of you. A USA Triathlon (USAT) membership is required. You will be able to purchase a one day or one year membership during registration. Must signup before event morning. Must be registered (paid for separately/additionally) to pickup event morning. If you register for the trail run, know that depending on your speed on the trails, you might want a headlamp and/or flashlight. The trail system and park is not lit up. It’s an actual trail we are using. Also know that in the event of the trails being too muddy to use, we may have to postpone to the following weekend. We will, of course communicate this ahead of time as soon as it’s realized. No refunds can be given if you can’t make the backup date. If we use the trails when they’re wet at all, this is a very special gift from the trail builders; and in the trail community, it’s expected to come out and help work on the trails after the event. It’s a ton of fun to get involved with trail maintenance and can be a great family day or day with friends (new and old). We’ll be in touch on this as well! Red X’s = No Parking Allowed. Blue P’s = General Parking. VIP Parking = Across Fry Rd. behind the Lakeland Village Center. Simply parallel park along the edge of N. Bridgeland Lake Pkwy, starting next to the Oak Meadow Park (just beyond House & Hahl Rd.) all the way up the road to Pope Elementary School. Earlier you get there, closer to the start line you’ll get. Packet Pickup location coming soon. Lookup your assigned race number and swim cap color (both below) before you go to pickup your packet. If you register Friday or Saturday before race day, you may not be able to look your bib # up online. Just show up to Packet Pickup, let them know, and you'll be assigned a bib there. Registered athletes must pickup their own packet and ONLY their own packet. The ONLY exception to this rule is for relay teams. One registered relay team member may pickup the packet(s) for all the team members if they have copies of their teammate's license(s). Registered athletes MUST have a valid government issued photo ID to pickup their packet. No exceptions. Parents may pickup their child's packet (youth or adult event) if their child is under 18 years of age. Anyone 18 & over must pickup their own packet. We do not need to see your USAT Annual License (if you have one). When you registered it either confirmed the validity of your USAT Annual License, charged you for a new one, or charged you for a 1-day license. Whatever the case, all athletes have been confirmed as far as USAT status goes. Bibs will be updated by week of race (mid-week). If you're registered for the race please click the button and check your information after Wednesday of the week of the event. You must know your assigned race number to pickup your packet. If you registered Friday or Saturday before the race, you won't be assigned a number in the online system. Just let them know at Packet Pickup and they'll give you a bib there. The list is alphabetical by last name. Names highlighted in red need to sign the USAT waiver at packet pickup. Names in yellow are missing information. Please log back into the Reg System if you need to make changes. If that section is closed, EMAIL US if you need to change or update information. Please note we cannot change shirt sizes, or divisions. Remember you cannot pickup anyone's packet but your own. The only exceptions are those parents picking up for their child (17 years old or younger) and relay team members that wish to pickup their entire team's packet. Team members wishing to do so must present their own photo ID along with copies or photos of the other members. No matter what you MUST have a government issued photo ID of some kind and you must pickup your own packet (with the two exceptions listed above). You can pay for and add VIP upon registering online. Only available to the first 250 that sign up. Parking - Special parking just for our VIPs. Food - Upgraded food option. Portable Toilets - A few will be setup just for VIP. Packet Pickup - Race day pickup if needed. Transition - Get your bike before all racers have finished. Waves will be updated by week of race (mid-week). 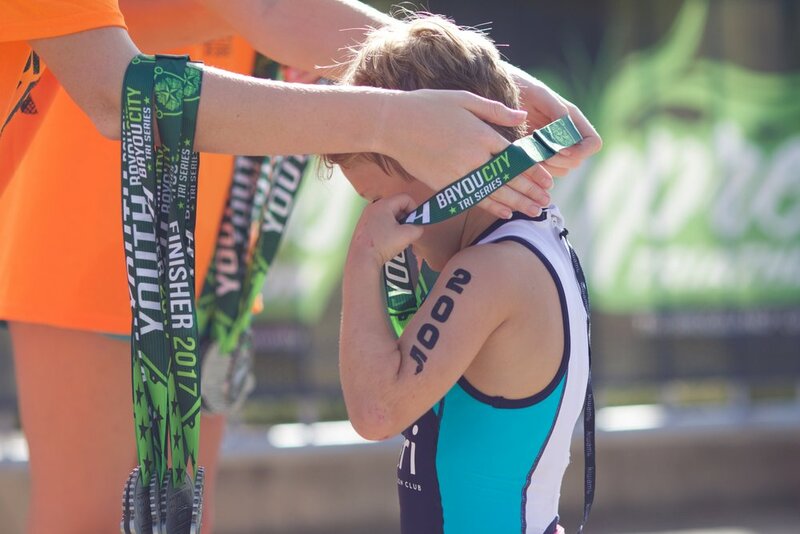 All youth competitors will stand next to their assigned spot in transition with their hand touching their race number that is on the transition rack. We will then call each transition row in order to lineup according to their number (lowest to highest) and proceed to walk the line to the pool area. Once in the pool area the short course kids will go first followed by a short break after which the long course kids will begin. The swim is to be completed by swimming one way in the lane, going under the lane rope and swimming back in the lane next to the athlete (progressing left). The short course kids will swim 2 lengths (50-yards), the long course kids will swim 4 lengths (100-yards). Once the children exit the pool they will run to their bikes in grass outside the parking lot and start their bike. We will line all dogs up on the dock on the side of Lake Bridgeland at around 6:50am. We will start with the smallest dogs first and work our way to the largest. The swim waves are below. Please know what wave your dog falls into. We will also have doggie lifejackets available on a first come first served basis if you wish to borrow one for the swim. You may also bring your own, but they are not mandatory. Leashes are mandatory to help keep your dog close to you and stop him/her from climbing on other dogs and humans while in the water. There will be an orange buoy all competitors must swim around before heading back to the beach shore. Once each dog/human team exits the water they will begin the run. Shoes should be put inside the fence at the edge of the beach prior to the event start. We will have a water stop on the course at about the half way point. If you need more water for you or your dog please bring it with you. Results will be available. Awards for top place in each category! Please know these categories might shift closer to race day. Some might get combined or split into two, depending on how many doggies show up. Everyone should be ready by 7am and listening to final instructions a little before then. Empty field as you approach Festival Park from high school parking. Located at intersection of House and Hahl Road & N. Bridgeland Pkwy. East of Pope Elementary School. Parking will be all along the edge of N. Bridgeland Lake Pkwy. IT IS EACH ATHLETE’S RESPONSIBILITY (INCLUDING YOUTH AND RELAY TEAMS) TO KNOW AND ABIDE BY USAT RULES. If you have questions before the event please ask via email. As the race is sanctioned by USAT, if you have a race day question you must ask one of the Certified USAT Officials. If you have any doubt please note the officials name to clarify after the event if needed. You have 60 minutes after the results have been posted to submit a written proposal to the USAT officials with your request. After that the ruling stands and we hope you can be happy knowing you did your best and had a blast! On the bike: Cyclists may carry a cell phone only if it is stored in a tool bag, out of sight. It may only be used if cyclist is dismounted. Phones cannot be mounted on handlebars or in view of the rider. On the run: Must be stored out of sight. Participants who use a phone must step off the course and may not advance while on the phone. The use of the phone while making forward progress shall result in a penalty. Only registered athletes are allowed in transition. Once your bike is brought into transition it is not allowed out until transition is reopened after the event. You may not move anyone else's bike. Find a volunteer, staff, or official. No glass bottles in transition. You may only enter and exit through the designated areas. No fence hopping or opening. Once transition is closed their will be no re-admittance for any reason until you come in from the swim. Relay team members may enter and leave transition once transition is closed but they are the only exception. PLEASE READ - VERY IMPORTANT - THOSE THAT DO NOT LEAVE TRANSITION ONCE IT IS OFFICIALLY CLOSED WILL BE DISQUALIFIED. THOSE THAT HAVE FINISHED AND ARE FOUND IN TRANSITION BEFORE IT'S OPEN WILL BE DISQUALIFIED. You must wear your assigned swim cap on the swim. You must have your bike frame sticker on during the ride. You must have your bike helmet sticker on your helmet during the ride. You must have the run bib on during the run. If you deviate from the course(s) at any time (making them shorter or longer) you will be disqualified. If you choose not to continue or you are disqualified you must alert race staff, officials, and/or timing. Please do not give your timing chip to a volunteer. There is no parking to be done within the Bridgeland Community. 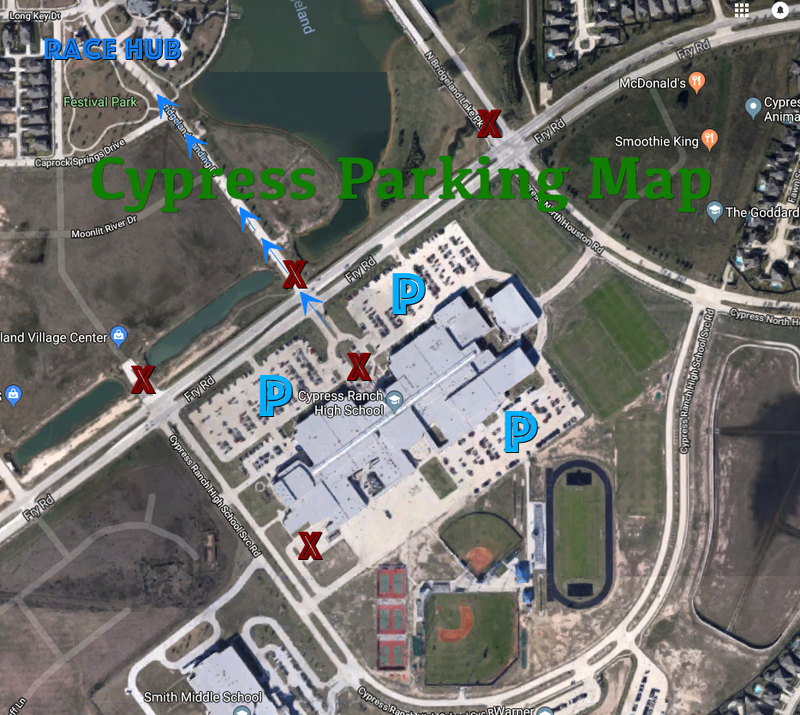 All parking must be done at Cypress Ranch High School across the street (Fry) from transition. We reserve the right to disqualify and ban anyone that is found to be using profanity and showing unsportsmanlike conduct and/or aggression. This is a family friendly atmosphere at all times. In other words, be nice, be civil, be an adult. For issues with your results, contact No Limits Timing. The timing chips are disposable but the ankle straps are not. 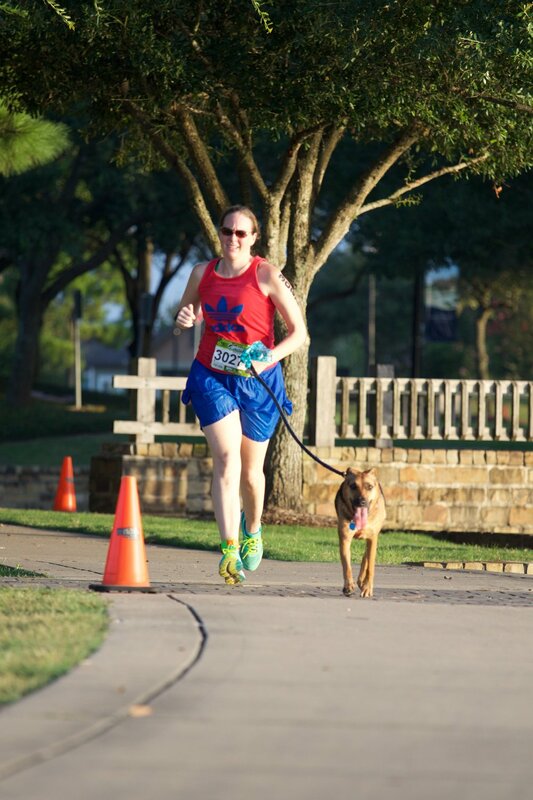 We will take them both at the finish line and recycle the chip and save the strap for the next event. 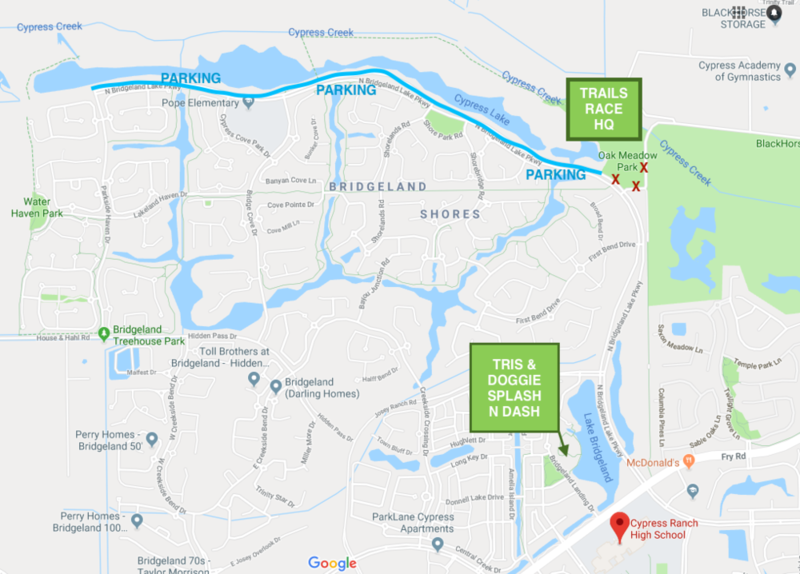 If by chance you pickup your packet but do not end up racing you may throw out your chip but please ask that you mail your strap to No Limits Timing - 3050 Knolin Dr, Bossier City, LA 71112. The invitational wave is NOT a pro/elite wave. This means that even though we have a separate wave for the invitational, if an age grouper beats an invitational athletes time, they have beat them and will be awarded an overall placement in the top 3. Age groupers that are brought up into the top 3 overall standing of the race are no longer eligible for age group or masters awards. Invitational athletes are also not eligible to go down into age group. EVENT SPECIFIC SPONSORS - THANK YOU!